The Crown of the Continent represents the largest intact ecosystem in the United Sates: the list of plant and animal species living here has remained unchanged since the time of the Lewis and Clark expedition. Within its 10-million-acre embrace lie Glacier-Waterton International Peace Park, the Bob Marshall Wilderness Complex, and the headwaters of three of North America's great rivers. Public lands in this region protect a rich diversity of wildlife found nowhere else on the continent, from grizzly bear to woodland caribou. Alongside this critical habitat, family farms and ranches carry on a cherished western tradition of working land. While the majority of this landscape is in public ownership, about a fifth remains in private hands. The fate of these lands will ultimately decide the fate of the entire Crown of the Continent ecosystem. To safeguard this unique habitat from fragmentation, The Trust for Public Land and its partners are working to consolidate “checkerboard” ownership patterns into an uninterrupted network of conserved lands. 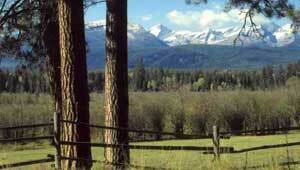 The result: permanent protection of lush forests, open meadows, and glacier-capped peaks across western Montana. Collaborating closely with private landowners and public agencies, we’ve helped conserve land across the Madison and Swan valleys—including 300,000 acres of former timber holdings through the internationally recognized Montana Legacy Project.